From Vietnam’s Mekong Delta to the supermarket shelves in Europe and America, certification is helping to guarantee that one of the world’s most consumed fish is farmed in a responsible way. Search the web for “pangasius” and you’ll discover a fish with an image problem. Cheap, boneless and versatile, this freshwater catfish has quietly become one of the world’s most consumed seafood species. Also sold as basa, cobbler, panga, swai, or sometimes just generic “fish”, Pangasius hypophthalmus is farmed in its native Vietnam and exported to more than 130 countries. But its rise in popularity has brought controversy – from criticisms of industrial fish-farming practices to unfounded assertions that it’s dangerous to health. There are even claims put about by the US catfish industry that pangasius from the Mekong Delta is contaminated with Agent Orange. One response that can help is credible certification – and particularly the Aquaculture Stewardship Council (ASC) standard. When consumers buy ASC-certified pangasius, they can rest assured that it’s been raised to standards that minimize impacts on ecosystems, set rigorous health requirements, promote good working conditions and ensure fish feed comes from sustainable sources. Since 2010, WWF has been working with D-Fish and industry partners as part of a project to improve the way pangasius is farmed in Vietnam. Through workshops, field trips and study tours, the SuPa (Sustainable Pangasius Supply Chain) project has trained hundreds of producers in better production practices that help them work toward the ASC standard. At the same time, the Ministry of Agriculture and Rural Development has been tightening up regulations to control the whole pangasius production chain, from feed and brood stock to processing plants, covering areas such as food safety and animal health. 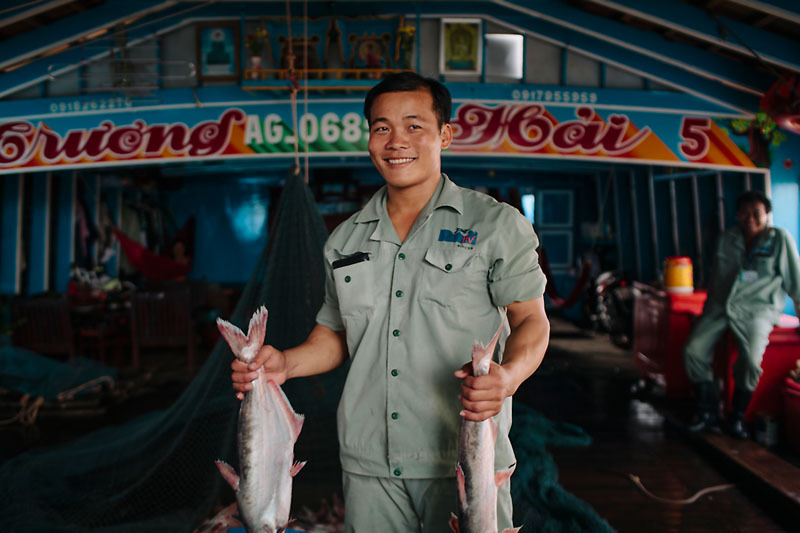 “The explosive growth of pangasius farms in Vietnam puts increased pressure on the environment, and needs to be carefully managed, says Tinh HuynhQuoc, WWF-Vietnam's food programme coordinator. The establishment of new farms can damage or destroy sensitive, critically important freshwater habitats and divert or pollute the waters of the Mekong Delta. Escaped farmed pangasius can compete with wild fish, throwing ecosystems out of balance. “The ASC standard guards against such negative impacts. This collaboration is a model for how both government and industry can ensure a sustainable pangasius farming sector to the benefit of everyone”. To date, more than 40 pangasius farms have achieved ASC certification, representing around a fifth of Vietnam’s production. Certified farms have better environmental and social outcomes, Luan says, pointing to the nitrogen and phosphorus content in wastewater as an example. While pollution from these elements can lead to algae blooms and other harmful impacts, the ASC includes science-based indicators to ensure discharges remain at safe levels. “For the conventional pangasius farms, the total nitrogen content is around 36.5kg per tonne of fish produced, and total phosphorus is around 9.1kg,” Luan explains. “ASC certified farms have good water treatment systems before discharging into the surrounding environment, so nitrogen and phosphorus concentration is lower at 27.5kg per tonne and 7.5kg per tonne respectively. “Also, average wages at ASC certified pangasius farms are 25-50 per cent higher than regional salary regulations, while workers also have social insurance, labour safety, and good working conditions,” he adds. Among the first Vietnamese companies to embrace ASC was Vinh Hoan, the country’s largest pangasius producer. “We have seen growing demand for sustainably certified fish products thanks to the increasing awareness of consumers worldwide,” says director of sustainability Dang Thi Thuong. “ASC is one of the most well recognized standards by importers, retailers and consumers. ASC has also helped improve the image of pangasius generally especially where there are media attacks on the fish, creating fair and transparent access for consumers. “We have been working hard with farmers to expand the certification to all of our farms,” she adds. One of Vinh Hoan’s clients is the Belgian seafood supplier Marine Harvest Pieters. “Our concerns with regard to the sustainability of pangasius production, the recurring negative media attention and the resulting doubts and concerns among our clients and consumers are the reason why we have always made a conscious decision to work only with those suppliers who are frontrunners in responsible aquaculture,” explains marketing and innovation director Margreet van Harn. WWF and D-Fish hope to see half of Vietnam’s pangasius production certified within the next few years. But it’s equally important to improve standards among uncertified producers. D-Fish has been updating its own regulations for fish farms in line with ASC’s principles in areas such as food safety, environmental protection and social responsibility – and is instructing local authorities to clamp down on those that don’t keep the rules. Currently, high prices are enticing many farmers to turn their rice fields into pangasius ponds – but the government and industry are determined not to let this undermine the progress made over the last few years. Workers at the Hung Vuong factory and fish farms unload their live catch of pangasius.